January 23, 2017 - Soybean prices increased dramatically over the week ending January 20 on reduced production estimates for the U.S. and increased uncertainty in the prospects for South American soybean production. Old crop soybean cash bid prices in central Illinois ended the week at approximately $10.40. New crop cash bid prices for harvest in central Illinois range between $9.90 and $9.94. The 2016–17 marketing year for soybeans, as it is currently shaping up, has a striking resemblance to 2015–16 marketing year expectations at this time last year. Despite the positive price outcome in 2016, a prudent soybean marketing plan for this year may possess some selling of 2017 soybeans in this price rally. University of Illinois commodity grains analysts Todd Hubbs discusses the January 12th USDA reports including Crop Production, Grain Stocks, and WASDE. A new “Product Performance” section has been added to the 2017 Crop Insurance Decision Tool. By using this section, users can examine per acre premiums and payments from alternative crop insurance products from 1995 to 2015, thereby allowing users to gain a feel for the historical performance of crop insurance products. For corn, users will notice that the 2012 drought had large impacts on crop insurance performance. Revenue Protection (RP) is the most used crop insurance plan for corn. Over time, RP use has grown to over 90% of corn acres insured in many counties in the corn belt (farmdoc daily, December 13, 2016). As illustrated by maps in this article, farmers in the corn belt typically select 80 and 85% coverage levels when using RP. Detailed statistics on a county basis are available from the “product use” section of the 2017 Crop Insurance Decision Tool). Overall, use suggests farmers prefer revenue insurances that allow guarantees to increase if harvest prices are above projected prices. 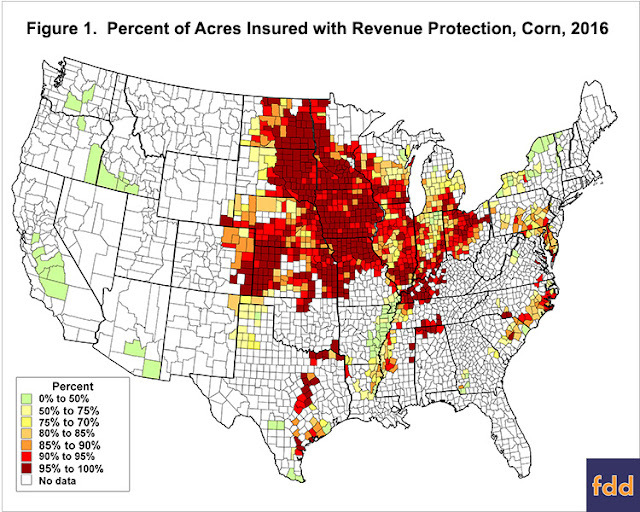 Use of high coverage levels suggests farmers value protection offered by crop insurance. According to 2016 Summary of Business statistics from the Risk Management Agency (RMA), RP use on corn acres is over 95% in most counties around the western corn-belt. For example, over 95% use predominates in North Dakota, South Dakota, Minnesota, Kansas, Iowa, and Missouri (see Figure 1). The soybean crop in Brazil looks to be mostly in good condition, however, as you’ll hear in this interview by Todd Gleason some areas are under performing. Jeff Brawn, Animal Biology - University of Illinois College of ACES NRESThe future of the red-capped manakin and other tropical birds in Panama looks bleak. A University of Illinois research project spanning more than three decades and simulating another five decades analyzes how changes in rainfall will affect bird populations. The results show that for 19 of the 20 species included in the study, there may be significantly fewer birds if conditions become dryer.